Seven Penguins and a coaching staff went to Sochi. Four Penguins will return with medals. It certainly isn’t a bad haul for the group as a whole, but the Penguins Olympians (or “OlymPens” as they have been called) dealt with a wide range of successes and disappointments. Here is a look at how their two weeks away from the NHL went as they return home for the stretch run to the playoffs. Malkin faced disappointment on both a team and personal level in Sochi. He finished the tournament with three points in five games, but all three of those points came in Russia’s opening victory over Slovenia. He was used mostly on the first line with Alexander Ovechkin and on the second powerplay. Chemistry with Ovechkin never came to pass, adjustments were never made, and though Malkin still managed to get the puck on net, he was unable to make a significant impact as Russia was knocked out in the quarterfinals by Finland. He certainly doesn’t deserve full blame for how he was used, but he was unable to make his mark as a game-changer when Russia needed it. As a center that is regarded as one of the best in the world, his inability to break through was a disappointment regardless of usage. Martin had a solid showing through four games before he was sidelined with a hand injury for the final two games, which happened to be Team USA’s only two losses. He didn’t figure into the scoring for Team USA, but he was very smooth in the transition game to get the puck into the offensive zone. Defensively, he spent much of his time alongside Brooks Orpik after the opening game as the pair shutdown Evgeni Malkin’s line against Russia and held Jaromir Jagr’s line in check against the Czech Republic. In the end, Martin did his job when he was healthy but is left with “what could have been” had he been able to stay healthy in the elimination round. Orpik was a hotly-contested pick going into the Olympics and he did very little to quiet his detractors over the course of two weeks. In all fairness, he did have some good moments. He played well against Malkin’s line versus Russia and also against Jagr’s line versus the Czech Republic. There was no question he played his best hockey alongside Paul Martin, just as it’s often the case in Pittsburgh as well. The memories of Orpik’s Sochi experience for most American fans will be ugly ones though. There was a missed hit in the Slovenia game that everyone ran to their gif machines to immortalize. More applicable to final results though, he was partially at fault for Datsyuk’s goal in the Russia game as he missed a poke check and gave Datsyuk the inside lane to the net. Keep in mind that there were two other US players at fault for that one as well though. Meanwhile, the worst part of Orpik’s tournament came against Canada, without Paul Martin by his side. He was frequently matched up against Sidney Crosby’s line and thus frequently bottled up in the defensive zone for long periods of time as Crosby’s line finally looked like what the world expected. When he wasn’t against Crosby’s line, Orpik was caught just a step slow in stopping Jamie Benn from scoring the only goal of the game on a beautiful redirect. Orpik didn’t have the horrendous overall tournament that many will pile on him for, but all it takes in a single-elimination tournament is a couple of bad shifts to ruin a tournament. Unfortunately for Orpik, that was the story of his tournament. Whether it’s fair or not, Team USA’s disappointing end to the tournament (1-0 loss to Canada, 5-0 loss to Finland) will take away from all of the good feelings created by a 4-0 start. The team scored zero even-strength goals against their best three opponents (Russia, Canada, Finland). While credit should be given to their opponents, that zero is an overwhelming statistic. The team looked eerily like Pittsburgh did in the Eastern Conference Finals last spring and that did no favors for Bylsma’s reputation. Questions about line matchups, finding ways to get players in front of the net, and finding motivation for the bronze medal game plagued the coaching staff in the end. 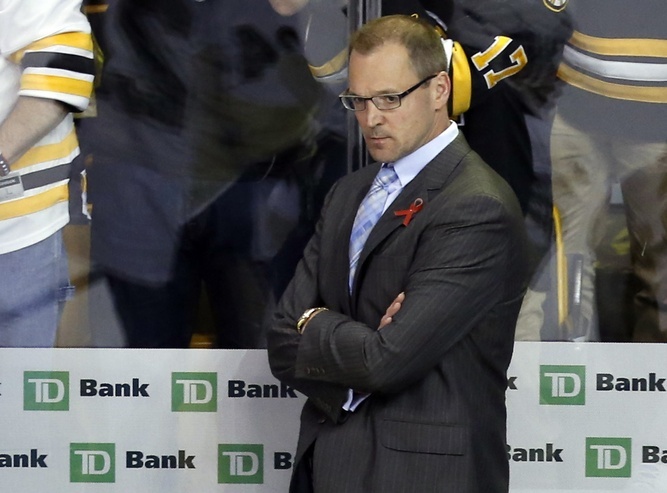 In the end, Bylsma is left with another sour ending and a reputation that is growing for the wrong reasons. Jokinen’s versatility was his biggest asset for Finland as he jumped between the first and second lines at wing and at center as the team dealt with injury after injury. He also spent time on the second powerplay with the occasional jump to the first line due to injuries. He finished with a modest five points, earning two in the opener against Austria and two in the bronze medal game against the US. He was also solid defensively, only making one costly mistake – losing Michael Grabner on a goal against in the opening game. Aside from a quiet game against Sweden in the semi-finals, Jokinen played above average and helped Finland along in the tournament. He basically took on the role he has in Pittsburgh and handled it successfully. Maatta’s tournament started inauspiciously as he found himself on the ice for the first two goals allowed by Finland. After a rough first period, the 19-year-old defenseman skyrocketed to prominence in a way that few teenagers could do. After playing just 13:56 in the opening game, Maatta found himself playing against the top lines versus Canada and Russia as he held his NHL teammates in check. He was also given time on both the second powerplay and the second penalty kill as he earned the trust of his coach. This culminated in earning the final shift against Russia as the Russians tried desperately to mount a comeback in the quarterfinals. The increased playing time did not come without some harsh lessons though. After a good string of games in the middle of the tournament, Maatta was outmatched against Sweden in the semi-finals. He was knocked off of the puck a few times in the defensive zone, including a bad turnover that led to Sweden’s first goal of the game in a 2-1 loss. Overall, it was a great learning experience for Maatta and just another sign that he’s ready and capable of playing against the best players that the world has to offer. He faced some growing pains along the way, but it was definitely a successful tournament for him. Much like Orpik, Kunitz was a heavily-debated pick when Team Canada’s roster was announced. Regardless of how or why he made the team, he gave everyone plenty to debate over in Sochi as well. Kunitz started the tournament on the first line with Sidney Crosby and looked uncomfortable in every way. After two disappointing games for the top line, he was dropped to the 4th line and received just over eight minutes of playing time in a win over Finland. The offense still wasn’t there though, so Kunitz was bumped back to the top line and finally it began to click. In the final three games of the tournament for Canada, Kunitz and Crosby finally found their forechecking and cycling ways. They dominated the offensive zone shift after shift, though neither could finish their chances. Both broke through in the end with a goal each against Sweden in the gold medal game. So how good was Kunitz overall? He created several chances, took a few unnecessary penalties, played well in his own zone, and only managed one goal. According to David Staples of the Edmonton Journal, Kunitz was one of the best two-way forwards in terms of scoring chances created and allowed. That being said, he didn’t produce nearly as much as anyone had hoped for. In the end, Kunitz had a decent tournament, though the box scores alone will not tell you that. With just three points in six games, most of Canada took turns panicking over why Crosby wasn’t producing in Sochi. After scoring a back-breaking goal in the eyes of Sweden in the gold medal game, those storylines have quietly faded away. Crosby struggled to get on the scoreboard through most of the tournament but managed to never have a bad game or even a bad period in Sochi. Regardless of his linemates, he created chances all tournament, drew penalties, and kept the puck in the offensive zone. His performances improved with each game and his only goal of the tournament all but clinched the gold medal for Team Canada. Sweden coach Par Marts says “the second goal let us down the most.” Of course that was Sidney Crosby’s goal. It wasn’t a perfect tournament for Crosby, but Canada’s captain did what he needed to do in the end for victory. Now that Canada’s celebrating is over, it’s time to get yourselves back into regular season mode with Sean Griffin’s Five Post-Olympic Storylines for the Penguins.